Quiet One and Inocente have been paired together to fill out a feature spot at this years Hot Docs as The Quiet One runs around 30 minutes and Inocente runs 40 minutes. They share a common thread in that they both deal with kids who are essentially outsiders, but that is their only link as their stories are worlds apart. The Quiet One deals with 6 year old Maryam, an Iranian refugee, whose parents have relocated to Sweden, and the first few months of her schooling. Maryam is a precocious girl who is behind the others in class because of the move and the fact she does not know the language yet. In one scene we see Mayram get extremely upset because all the kids are talking about their Christmas break and their presents in class and she has no idea about Christmas and what it is. Maryam is outcast due to her language barrier and she lashes out, violently at times, in response to this. Maryam desperately follows around the “popular” girls in class, who rarely have time for her. It’s not until the end of the film that we see she may have made a true friend, in a interesting way. The Quiet One is a fascinating portrait of this girl without exploiting her in any way. 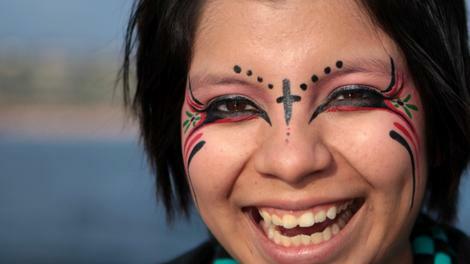 Inocente is about a 15 year-old girl, named Inocente, who has led and incredibly tough life. She has grown up homeless in San Diego ever since her mother packed her and her two younger brothers up and left her abusive husband behind. She has grown up in halfway houses and shelters since then, never living in one place for more than three months. The situation is exasperated by the fact that her mother is in the country illegally, severely hampering her employment opportunities. Inocente has found an escape for her frustrations in the A.R.T.S. program (A Right To Survive) which has fostered her artistic side and she has flourished. A talented artist that loves to explore bright vibrant colors, we follow Inocente as she prepares for her first art exhibition. She’s one of two out of 300 students chosen for her own show, and now she has must create 30 new pieces, with less than three months to prepare. There are issues at home as well between her and her mother which leads Inocente to make a life altering decision. Inocente herself is engaging, modest and truly talented. Her story is compelling and the Fines do an excellent job in portraying her struggles and successes. Two different film that succeed for very different reasons. This is a double-bill I’m very happy I was able to catch.